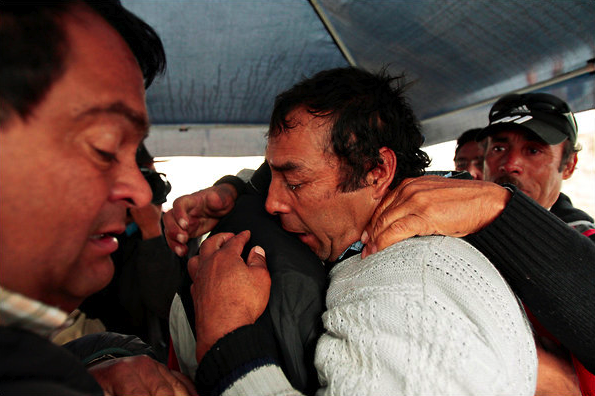 LookSeeNow: Chile's Trapped Miners are Freed from their Tomb. 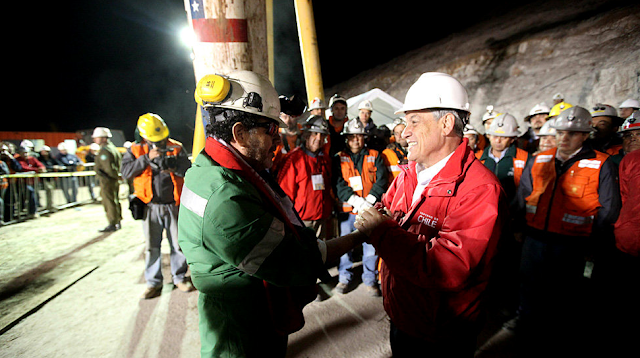 Luis Urzúa, the last miner to be rescued, celebrated with President Sebastian Piñera of Chile. 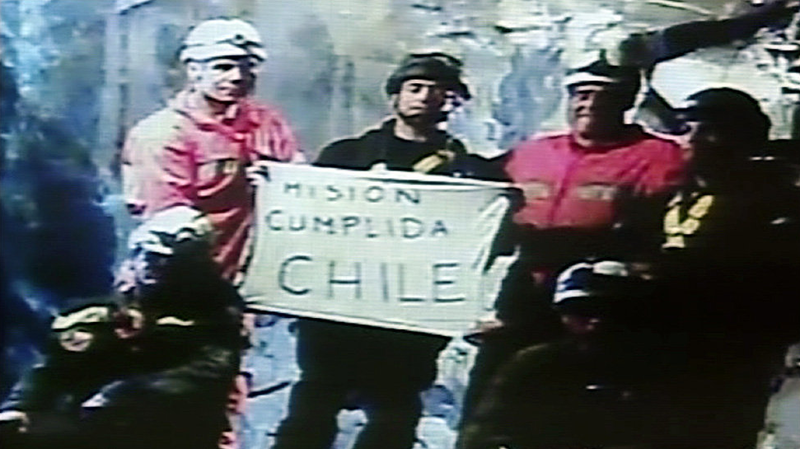 The Chilean Miners rescue is one of those rare news stories which are followed from the start, and end in the best possible outcome. All 33 miners, alive and released from their cold, damp prison, 700m underground. It is also one of those which the images will become some of the iconic moments of this time. 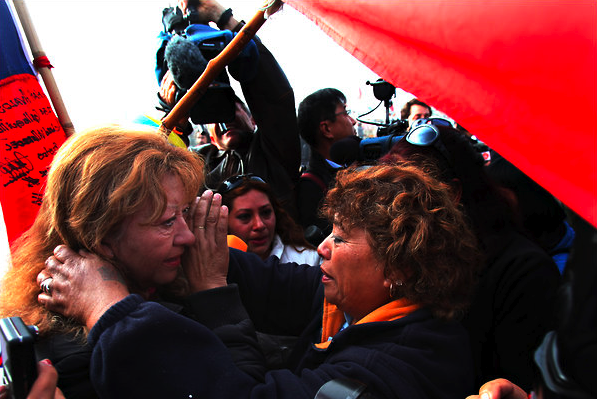 Relatives of the trapped Chilean miners celebrated after a powerful drill had broken through to reach the men. 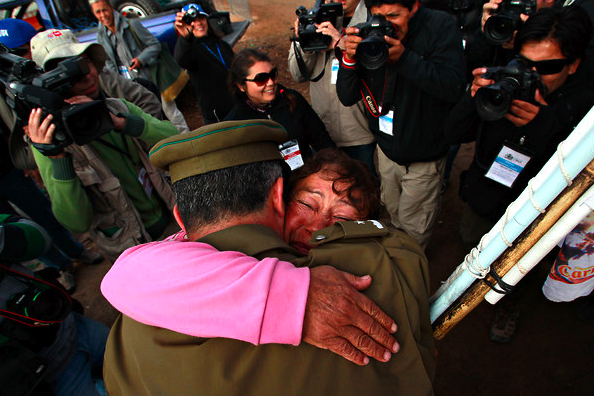 A police officer and a relative of a trapped miner, with their hug captured by the media. Of course this is also one of those events which attracts a lot of media. 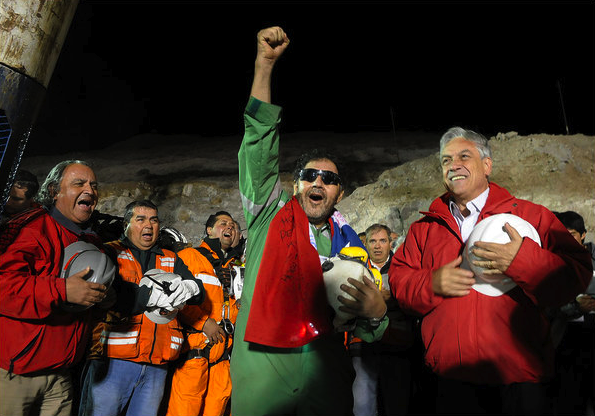 The worlds news stations have had 69 days to get to the San Jose mine located near Copiapó, Chile and it has become one of the most watched online and television events of all time. I've been following the pictures coming from ground level and they are inspiring to see. The New York Times as always has some well selected photographs, the first set as the Rescue Tunnel Reaches the Miners and the second, of the Mine Rescue Operation Complete. 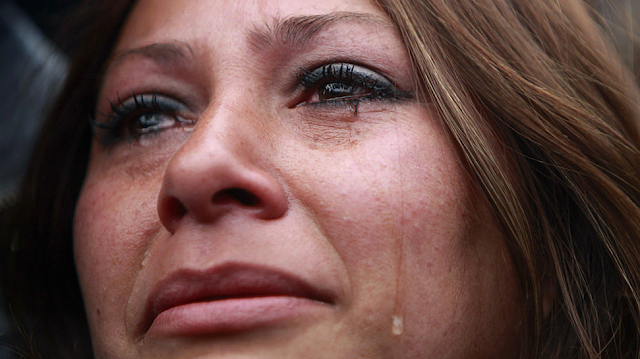 The reaction of relatives of the trapped miners. 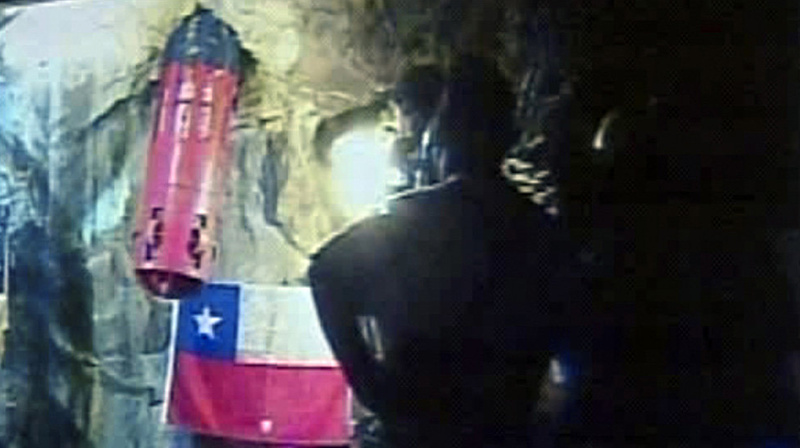 Family members of the miners ran up the hill above the mine waving Chilean flags. BBC News have produced an audio slideshow of the 69 days the miners were underground. The audio alongside the images adds another dimension and makes the event even more emotional for the viewer than the images are when seen in a static nature. The capsule to carry the miners to the surface emerges into the cavity. Miners still trapped show support for their country. The images show the miners friends and families hope, elation when good news is received about those trapped and the love they have for their country. For these last 2 months Chile as been devoted to supporting and rescuing the miners. 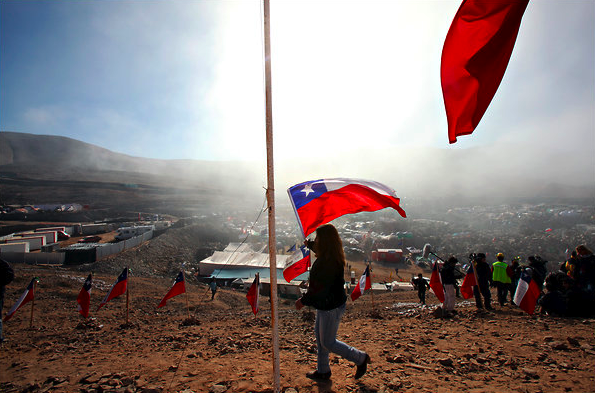 Chile has had it's international profile increased and it has become known for the passion and regard that it's people have for their country. 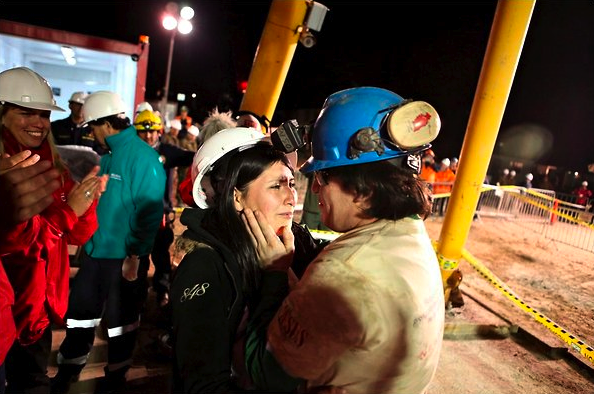 Osman Araya, the sixth miner to be rescued, embraces his wife, Angelica. The last miner to be rescued, Luis Urzua, is greeted by President Sebastian Pinera. Images sourced from BBC News and the NY Times image galleries, Rescue Tunnel Reaches Miners and Chile Mine Rescue Operation Complete.